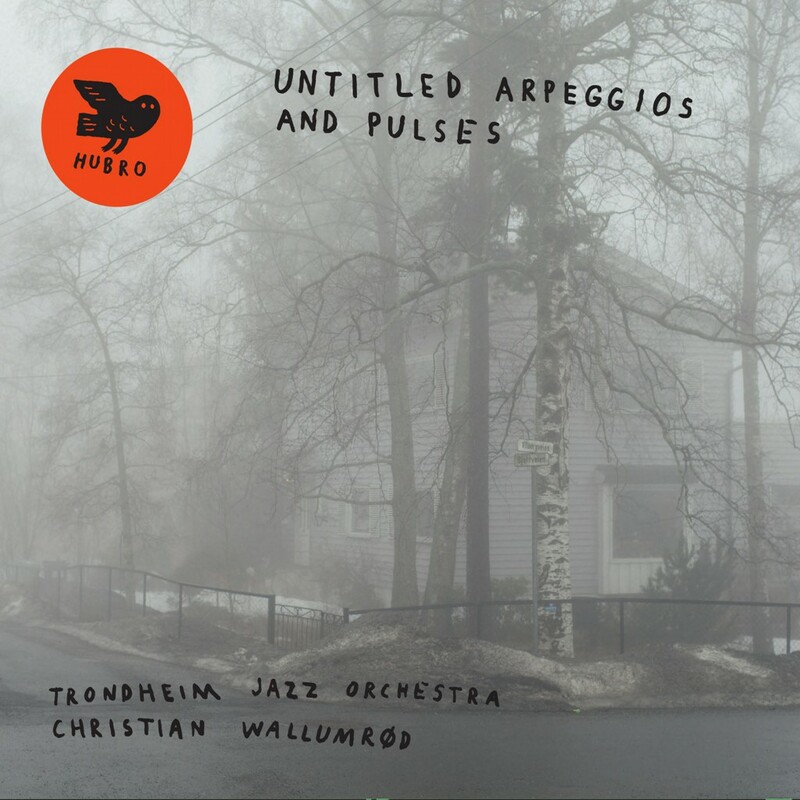 Christian Wallumrød has, together with the Trondheim Jazz Orchestra, created a new and exciting album that confirms his abilities as a unique composer and the flexibility of the never-static jazz orchestra. Christian Wallumrød was commissioned to compose a work for Trondheim Jazz Orchestra on the occasion of the Kongsberg Jazz Festival’s 50th anniversary in 2014, and it was really a work with a capital W that he produced. “Untitled Arpeggios and Pulses” is a piece of music just over 50 minutes long that should be listened to continuously from start to finish, and that will thus not be made available in the LP format. The clearly pulse-driven work consists of four parts that are connected and range from the unassertively acoustic to the intensely forceful. On this occasion the Trondheim Jazz Orchestra consisted of Wallumrød himself along with a selection of his favourite musicians. Some he had already worked with for a long time in other bands, while others were more recent acquaintances: guitarists Ivar Grydeland (Huntsville, Dans les Arbres) and Lars Ove Fossheim (Broen, Skadedyr), pianist Anja Lauvdal (Moskus, Broen, Skadedyr), saxophonist Espen Reinertsen and trumpet player Eivind Lønning (Streifenjunko and Christian Wallumrød Ensemble), tubist Heida Karine Jóhannesdóttir Mobeck (Broen, Skadedyr), drummers Fredrik Wallumrød (Brutter) and Siv Øyunn Kjenstad (Chili Vanilla, Thomas Strønen), and finally double bassist Michael Francis Duch (Lemur). Trondheim Jazz Orchestra is one of the most important and creative jazz ensembles in Norway. The orchestra is operated as a musicians’ pool, so that the orchestra changes as to instrumentation and size from project to project. During the course of the last thirteen years, the orchestra has had a great number of exciting projects with norwegian and international jazz profiles such as Chick Corea, Pat Metheny, Joshua Redman, Erlend Skomsvoll, Eirik Hegdal, Vigleik Storaas, Geir Lysne, Bendik Hofset, Maria Kannegaard, Kim Myhr, Jenny Hval, Stian Westerhus, Ståle Storløkken, Albatrosh and Marius Neset. Christian Wallumrød (b. 1971) has for many years been regarded as one of the most prominent and original creative talents in the Norwegian music world. He is instantly identifiable both as a composer and as a pianist, but at the same time any attempt to categorise his music is doomed to fail. His background is in jazz and church music, and in his five records with changing ensemble members on ECM he has erased the borders between jazz, hymns, gospel, folk music, baroque music and contemporary music, and has carved out his own niche in the hearts and minds of listeners and reviewers alike. Parallel with this he has worked with the quartet Dans les Arbres, who continue to make their mark on the international improv and contemporary music scene. Wallumrød has also had noteworthy collaborations with artists such as Sidsel Endresen, Audun Kleive, Susanne Sundfør, Ricardo Villalobos & Max Loderbauer, Karl Seglem, Oslo Sinfonietta and Kim Myhr. Wallumrød won a Spellemannspris, the Norwegian Grammy, for the album “Outstairs” (ECM, 2013), and was nominated for the Nordic Council Music Prize for the album “Fabula Suite Lugano” (ECM, 2010). Dans les Arbres has been nominated for the same prize in 2015. “Untitled Arpeggios and Pulses” is Wallumrød’s third release on the HUBRO label this year. We released his first solo album, “Pianokammer”, to glowing reviews in January, and a limited edition LP with the duo Brutter this past summer. The album is available as a CD and a DL. Trondheim Jazzorkester har i mange år samarbeidet med noen av landets fremste komponister innen jazz og beslektet musikk. Nå er turen kommet til Christian Wallumrød, en mann som har beveget seg mer og mer i retning samtidsmusikk etter at han gikk ut fra Jazzlinja på NTNU på 90-tallet. I «Untitled Arpeggios and Pulses», et firedelt verk som nylig ble urframført av Trondheim Jazzorkester i Dokkhuset, er han selv en sentral musiker på piano, synthesizere og trommemaskiner. Han har i tillegg med seg åtte yngre musikere på blant annet gitar, saksofon, trompet og tuba. Helheten er uansett mest preget av tangenter og elektronikk. Ordet «pulses» i tittelen på verket er sentral. Musikken rusler avgårde i stort sett sakte puls. Den flanerer hit og dit, tilsynelatende uten mye dramatikk. Det er de ørsmå nyansene som skal vekke lytterens interesse i dette verket. Dermed må den som lytter, være ytterst oppmerksom. De som klarer å konsentrere seg, får rikelig med belønning, for som vanlig består også denne versjonen av Jazzorkesteret av ypperlige musikere. Den lyriske trompeten til Eivind Lønning og Espen Reinertsens saksofoner er noen av instrumentene som bidrar med fin fargelegging. «Untitled Arpeggios and Pulses» går inn i en lang rekke albumutgivelser som viser at de mange ulike utgavene av Trondheim Jazzorkester har minst én felles egenskap: De kvier seg aldri for å utforske nytt og utfordrende musikalsk landskap. One of the few Norwegian improvisers known outside his country through his membership in Dans les Arbres and other groups, keyboardist/composer Christian Wallumrød is also part of a minority of Scandinavian players not affiliated with any particular local coterie. Although often linked to the so-called frigid northern sound, a disc like Untitled Arpeggios and Pulses prove that like a dour accountant who is a flamboyant roué after hours, Wallumrød is conversant with divergent styles. As different as Trondheim is to Tijuana the four-part Untitled Arpeggios and Pulses finds Wallumrød playing piano, harpsichord, synthesizer and drum machines as part of a dilatory four-part program developed with the 10-member Trondheim Jazz Orchestra (TJO) that includes two keyboardists, electronics, and two guitarists, one of whom is Dans les Arbes’ Ivar Grydeland. With Grydeland’s pedal steel reverberations often extrusive as the narrative involves at a pace more leisurely than Marco Polo’s voyages to the Orient, the program appears to consist of the kernel of Morton Feldman-like indeterminacy mixed in with a tang of Sneaky Pete Kleinow-like steel guitar vibrations. Introduced by foreshortened piano textures that are as reminiscent of Floyd Crammer as David Tudor, mewling electronics keep a consistent droning sounding throughout. Elaborated as if each TJO members is enclosed within a box, during “Part 2” and “Part 3”, the unfocused theme is only sporadically interrupted by stuttering guitar licks, rubs on double bass strings, piano string plucks, choked horn breaths and rattling jounces from little instruments such as gongs, bells and glass bottles. Next to atmospheric pedal steel whines the only constant is repetition of the initial theme, although whether played by Wallumrød or Anja Lauvdal, also featured on piano, harpsichord and synthesizer isn’t clear. The effect is oddly disquieting, like the build-up in tension during a horror flick, with the idea that an undefined menace is looming; but here it’s one that never arrives. If the previous sections could be defined as stasis, then “Part 4” provides the vigorous climax and release. With a stormy crescendo every musician is heard to the extent that together the orchestra resembles the bellowing of a mammoth pipe organ. Twanging electric guitars cut through the electronic mist at the same time as trumpeter Eivind Lønning, tuba player Heiða Karine Jóhannesdóttir Mobeck and tenor saxophonist Espen Reinertsen modulate their collective timbres to passionately and decisively embrace the electric – and electronic – output. Our first (and last) encounter with the Norwegian ‘jazz’ pianist Christian Wallumrød was bemusing to say the least, an effect partly brought about by the connotations of using the j-word, by Wallumrød’s history with the ECM label and by that record’s unfailing ambiguity of style and intention. Intriguing to a fault, Pianokammer defies the finger of categorisation, falling somewhere ’between the realms of easy listening and cold abstraction’, to the point at which questions such as ‘do I like this?’ become redundant. Whatever motivations led to the recording of that strange selection, they remain invisible to the naked ear. Its successor – Untitled Arpeggios and Pulses – arrives in a similar cloak of cool mystery and a title suggestive of the anonymity and simplicity of its ethereal ways. Carried by The Trondheim Jazz Orchestra as a commission for Kongsberg Jazz Festival’s 50th anniversary in 2014, the ‘action’ has moved from the fire-lit living room in winter to the chilled auditorium where quiet coughs mingle with the steam of musicians’ breath. Suspended in air, rendered sluggish by hibernation instincts or lurching like locked groove vinyl, the four sections of this 50+ minute composition consist of short, semi- and atonal phrases repeated ad infinitum by small and unusual instrumental assortments that include piano and pedal steel peddling peace and forgetfulness (part 2), to a trudging, trash-coated behemoth for graunching guitar, Supersilent-style electronics and jubilant bursts of winter-numbed brass. Clearly intended for a single sitting: walk in at any moment to find an absolute mess. Sit back however, and enjoy the unfurling from afar and things might start to click into place. Devoid of straight up ‘jazz’, the orchestra’s dedicated pursuit of the ‘pulse’ overrides all other aesthetic commitments. It’s challenging music in the best possible sense, and best of all, it knows when to keep its mouth shut.